*Struggled in last two races, when 10th at Sandown Park in a veterans' chase over three miles on January 6, before finishing a well-beaten fifth behind Definitly Red in the G2 BetBright Cotswold Chase at Cheltenham on January 27. *Boasts a fine record at Cheltenham, winning three handicap chases at the course, two in 2016 and the latest coming in a G3 handicap chase in November, 2017. Was also a nose second to Theatre Guide in the G3 Unicoin Handicap Chase (3m 2f) at the 2016 November Meeting. *Pulled up before the fourth-last fence in the 2017 Randox Health Grand National won by One For Arthur. *Lives in the stable next door to Alvarado, who was fourth in both the 2014 and 2015 Grand Nationals - O'Brien describes the pair as "best of friends". Incite Solutions Limited (ISL) Recruitment is a Bristol-based business that was founded by Geoffrey Keeys and Simon Ranahan in 2007. ISL an award-winning specialist IT and engineering recruitment consultancy. Keeys has a degree in law from Manchester University and over 30 years board experience in international business in the oil, engineering and financial services industries as well as in the UK public sector. He was Director of Group Business Services for Prudential Corporation plc between 1984 and 1995. Prior to joining Prudential, he held director positions for Chubb plc which had worldwide businesses in the mechanical and electronic security industry and for Massey Ferguson's European and World Export operations, a manufacturer and distributor of agricultural equipment. In 1995 he started the Strategic Thinking Group in the UK, a business that provides clients with processes that help them develop, implement and sustain their business strategy. He has worked closely with chairmen, chief executives and other board members of businesses both on the development and implementation of business strategy and board effectiveness issues. He was a non-executive director of Her Majesty's Prison Service in the early 1990s and has been a trustee of a number of charities and pension funds. He is an investor in early-stage businesses. His clients include FTSE 100 organisations such as Prudential Corporation plc and Old Mutual, FTSE 250 organisations such as Christian Salvesen and UK Mail as well as not for profit organisations such as the London Clinic and the Institute for Customer Service. Geoff and his wife Donna, who live in the Gloucestershire village of Ford, have been heavily involved with the Fergal O'Brien stable since the trainer took out his licence in 2011 - ISL is the stable's sponsor and Fergal credits Geoff as a mentor to the business side of the operation. 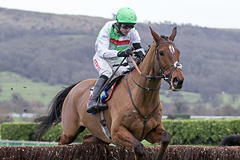 The couple have also been long-standing owners with O'Brien's neighbour Nigel Twiston-Davies. Initially involved in syndicates, the Keeys started having runners in their own colours in the late 1990s. One of their first horses to run in their colours was Gentle Rivage who won a G2 novices' hurdle at Uttoxeter in 1999 before going to finish third in the G1 Neptune Investment Management Novices' Hurdle at the Cheltenham Festival in 2000. Perfect Candidate provided them with a big-race success when landing the G3 BetVictor.com Handicap Chase at Cheltenham's November Meeting in 2017.